These healthy juicing recipes will restore your body to optimum health. Each of these recipes of fresh raw vegetables and fruits will supply you with the nourishment you need to correct any imbalance including obesity! These particular combinations were carefully chosen for their potent regenerative and detoxifying effects. You will transform your body and your life when you make these fresh, raw juices a daily habit! Get the strongest blender or simplest juicer you can find. I prefer the Vitamix blender because you will be eating the fiber and it's strong enough for any vegetable. Wash the vegetables thoroughly and peel only the carrots. Chop the softest vegetable and put in the bottom of the blender, going to the coarsest near the top. Add a cup or so of water if you have a blender because the fiber will be left in. The recipes make enough for two 8 oz. juice drinks for 2 people a day. Blend until smooth and drink at least one 8 0z. glass a day. If you are interested in the nutrient content of the veggies in these drinks be sure to read this page. If you can manage two, one in the morning and one in the evening, all the better! Each recipe makes about a quart of juice. Drink within 2 days. If your vegetables are small just chop up more spinach or kale or add celery sticks and leaves to make a quart. Add a cup to 2 cups of filtered water if you are using a blender. Each vegetable will add a unique, lively flavor. Celery and cucumber tend to lighten the drink flavor so they are great blenders along with the apples, carrots and tomatoes. Don't combine the sweeteners, apples and carrots, with the tomatoes. Tomatoes bring a more savory flavor. These vegetables are full of phytonutrients, vitamins and minerals and antioxidants that build your natural immunity, support your eyes, bones and heart, your metabolism, digestion and cell health. Other vegetables to juice are broccoli stalks and leaves, cabbage quarters, savoy, beets or collard greens. Experiment with different combinations to see what you like. If you have been on a lot of diets and eating improperly for a long time, healthy juicing recipes are an effective way to nudge your body into shedding fat and keeping it off. When you are carrying excess weight your fat cells are toxic. This will help you clean your system. You need to nourish your cells back to health and accelerate the fat loss. You will be altering your body's biochemistry to a more alkaline state. This is the way to increase your insulin sensitivity and reverse type 2 diabetes. When you are fat, your body is likely quite acidic and you need to recalibrate. Enzymes are the spark for the thousands of biochemical reactions in the body that control all the life processes. They are involved in all bodily functions. Raw, fresh vegetable juices are full of living enzymes. They are the elixer of life! There are 2 types of enzymes, digestive and metabolic. Metabolic enzymes are responsible for detoxification and energy. When you are overweight it's the metabolic processes that are impaired. The way to rejuvenate your health and lose weight is by juicing plenty of vegetables every day. For more information about the specific nutrients in each vegetable go to vegetable nutrition facts. Each day of the week you will be shedding more fat and gaining better health when you utilize these healthy juicing recipes every single day. Raw vegetable juices will have a cleansing effect upon your intestinal and digestive tract and will greatly help in your overall detoxification. If you are symptomatic with any type of illness and have been eating lots of processed and white foods, you will likely experience a cleanse. Expect to feel sick before you start feeling fantastic. Stay with with healthy juicing recipes and drink lots of water and minimize your activities if necessary until you start feeling better. Walking or other aerobic activity will hasten the healing process. If you have diabetes or any health impairment check with your doctor before starting your juicing program or embarking on new exercise. 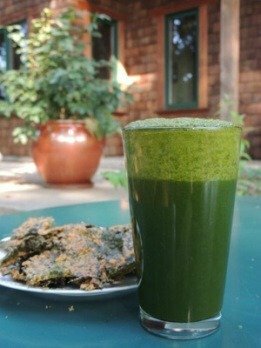 Raw, fresh, vegetable juices are highly therapeutic and will improve the quality of your diet to such an extent that all manner of illnesses can be corrected. They are full of vitamins and minerals, enzymes and amino acids and are vital to the proper functioning of our bodies. When you have a lot of fat to lose there is no better way to ensure your health, energy and the most efficient metabolic functioning than to juice daily. Juicing greatly accelerates your weight loss! This blender will make your daily juicing super easy. Return from Healthy Juicing Recipes to Food Nutrition Facts. Return from Healthy Juicing Recipes to Lifetime Fat Loss home page.